Volvo Penta of the Americas has been selected to supply the engines, drives and controls for the new U.S. Coast Guard Cutter Boat Large (CBL) rigid-hull inflatable boats (RIBs), which are being built at Metal Craft Marine. The boats will be powered by Volvo Penta three-liter 220 hp diesel Aquamatic sterndrive systems with HD controls. 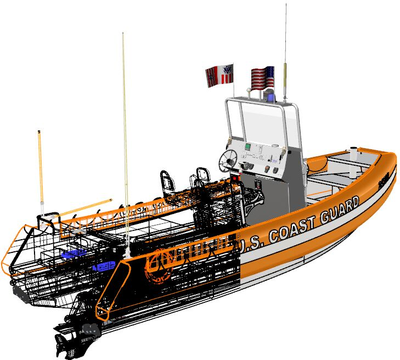 The Coast Guard awarded a Five-Year Indefinite-Delivery Indefinite-Quantity (IDIQ) contract to Metal Craft to build and deliver a minimum of 46 new seven-meter RIBs with deliveries to begin in 2019. They will be constructed at Metal Craft’s shipyard in Cape Vincent, New York. The RIBs are designed for a top speed of 35+ knots carrying up to 13 passengers with an operating range of 200 nautical miles in up to four-meter wave heights. They will be carried on three different classes of U.S. Coast Guard cutters.